I began to think of myself as a skeptic of paranormal and pseudoscience claims about 1969 when I became a magician and began to follow in Houdini's footsteps. 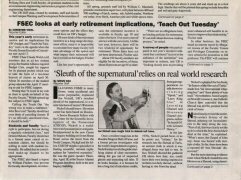 By 1988 I was elected a Fellow of the Committee for the Scientific Investigation of Claims of the Paranormal (CSICOP), publisher of Skeptical Inquirer science magazine. In 1995 I became a full-time skeptic (as CSICOP'S Senior Research Fellow) and I began to write a regular column for SI. 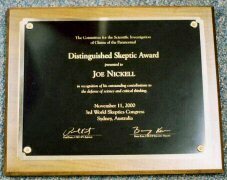 CSICOP awarded me its Distinguished Skeptic Award on November 11, 2000, at the 3rd World Skeptics Congress at Sydney, Australia. (See also Paranormal Investigator.) 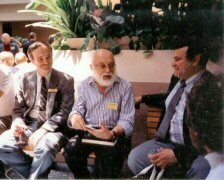 In the photo below, I am shown with colleagues James Randi and the late Gordon Stein at another CSICOP conference. The article is from the University of Buffalo Reporter, April 25, 1996.